The 115-mile (185 km) long river flows southeast for 90 miles (140 km), then south for another 25 miles (40 km). The river empties into Norton Bay, which it enters via a tidal estuary downstream of the river's confluence with the East Fork Koyuk River near the village of Koyuk. The last stretch of the river,  is in a southeasterly direction as it joins the bay,  and flows through the tundra wetland area. The catchment in the middle and upper reaches has a horse-shoe shape, and the hills surrounding the valley lie in an elevation range of 2,000 to 3,000 feet (610 to 910 m); the two prominent mountains are the Bendeleben Mountains and Domes of Granite Mountain, the latter named after the granite geological formations. The river becomes a broad estuary subject to tidal effect extending for long stretch upstream forming a flat mud- and sand-filled basin. The basin area measure approximately 2,000 square miles (5,200 km2). The Bering Land Bridge National Preserve is in the uppermost part of the basin. Its drainage includes southeastern Seward Peninsula through Norton Bay. ^ a b c d e f "Koyuk River". Geographic Names Information System. United States Geological Survey. January 1, 2000. Retrieved September 26, 2013. ^ a b Burch, Ernest S. (2005). Alliance and Conflict: The World System of the Inũpiaq Eskimos. U of Nebraska Press. pp. 276, 296–. ISBN 978-0-8032-6238-6. ^ Bulletin of the United States Geological Survey (Public domain ed.). U.S. Government Printing Office. 1902. pp. 251–. Retrieved 23 March 2013. ^ Baker, Marcus (1902). Geographic Dictionary of Alaska. U.S. Government vffice. pp. 251–. ^ Brooks, Alfred Hulse; Abbe, Cleveland; Goode, Richard Urquhart (1906). 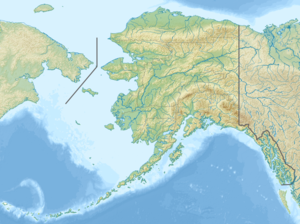 The Geography and Geology of Alaska: A Summary of Existing Knowledge. U.S. Government Printing Office. pp. 93–. ^ Geological Survey (U.S.) (1911). Bulletin – United States Geological Survey (Public domain ed.). The Survey. pp. 10–. Retrieved 27 March 2013. ^ a b c d e f DeVaughn, Melissa (2011). Alaska AdventureGuide. Menasha Ridge Press. pp. 69–60. ISBN 978-0-89732-907-1. ^ a b Geological Survey Bulletin. U.S. Government Printing Office. 1913. pp. 1–. ^ Brooks, Alfred Hulse; Collier, Arthur James; Mendenhall, Walter Curran; George Burr Richardson (1901). Geological Survey (U.S.) (ed.). Reconnaissances in the Cape Nome and Norton Bay regions, Alaska, in 1900 (Public domain ed.). Government Printing Office. pp. 191, 198, 212–. Retrieved 23 March 2013. ^ Geological Survey (U.S.) (1902). Professional paper – United States Geological Survey. The Survey. pp. 1–. ^ United States. Heritage Conservation and Recreation Service (1980). A proposal for protection of eleven Alaskan rivers. The Service. p. 63. ^ United States. Bureau of Reclamation (1952). Alaska: A Reconnaissance Report on the Potential Development of Water Resources in the Territory of Alaska for Irrigation, Power Production, and Other Beneficial Uses. U.S. Government Printing Office. p. 172. ^ Sturtevant, William C (1978). Handbook of North American Indians: Arctic. Government Printing Office. pp. 303–. ISBN 978-0-16-004580-6. ^ Bockstoce, John R. (2009). Furs and Frontiers In the Far North: The Contest Among Native and Foreign Nations for the Bering Strait Fur Trade. Yale University Press. pp. 306–. ISBN 978-0-300-15490-0. ^ a b c d e "Wildlife of the Koyuk Watershed". Bureau of Land Management, Alaska. Retrieved 26 March 2013. ^ a b c "Koyuk River Hunting and Fishing...Enjoy One Of The Many Scenic Rivers in Alaska!". Alaska Fishing and Hunting Guides Directory. Retrieved 26 March 2013.